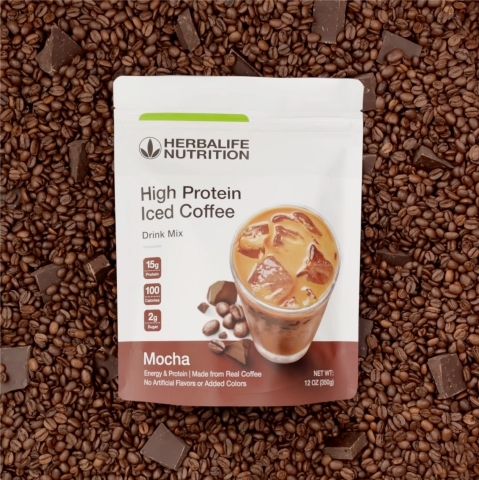 LOS ANGELES--(BUSINESS WIRE)--Herbalife Nutrition (NYSE: HLF), a premier global nutrition company whose purpose is to make the world healthier and happier, today introduced a new way for consumers to have their coffee and get their protein too, with the launch of a Mocha High Protein Iced Coffee. Low in calories, sugar and fat, but big on taste, the 100-calorie drink mix has no artificial flavors or added colors and provides 15 grams of protein and 80 mg of caffeine per serving. The iced coffee market is red hot and according to Mintel, sales grew at least 10 percent annually between 2013-17. Further echoing the love of coffee, Herbalife Nutrition’s recent global breakfast survey of over 8,000 people revealed that in the U.S. specifically, more than 60 percent of consumers drink coffee daily. And younger coffee drinkers are driving the iced coffee category growth. In 2017, more than 50 percent of millennials said they drank iced coffee in the last three months, up from 46 percent the previous year. Herbalife Nutrition High Protein Iced Coffee has 14 servings per 12-ounce bag and a suggested retail price of $38.50. Easy to make in seconds, consumers simply add two scoops of the drink mix to water, shake, pour over ice and experience a delicious, refreshing and nutritious way to power them throughout the day. Herbalife Nutrition is a global nutrition company whose purpose is to make the world healthier and happier. The Company has been on a mission for nutrition – changing people's lives with great nutrition products & programs – since 1980. Together with our Herbalife Nutrition independent distributors, we are committed to providing solutions to the worldwide problems of poor nutrition and obesity, an aging population and skyrocketing public healthcare costs, while supporting the rise in entrepreneurs of all ages. Herbalife Nutrition offers high-quality, science-backed products, most of which are produced in Company-operated facilities; one-on-one coaching with a Herbalife Nutrition independent distributor; and a supportive community approach that inspires customers to embrace a healthier, more active lifestyle. Herbalife Nutrition's targeted nutrition, weight-management, energy and fitness, and personal care products are available exclusively to and through dedicated Herbalife Nutrition distributors in more than 90 countries. Through its corporate social responsibility efforts, Herbalife Nutrition supports the Herbalife Nutrition Foundation (HNF) and its CasaHerbalife Nutrition programs to help bring good nutrition to children in need. Herbalife Nutrition is also proud to sponsor more than 190 world-class athletes, teams and events around the globe. Herbalife Nutrition Creates a Stir in the $38 Billion Coffee Industry With It’s New High Protein Iced Coffee.